Krabi Getaway! | Teefa Says..
i finally went to Krabi, ya'll!! Now, let's skip the babbling and more details on the trip. i'm ready to be your tour guide. 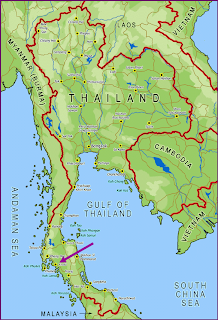 For those of you who is clueless on where in the world is Krabi, it's in Southern Thailand. Contrary to popular belief, Krabi is not an island. It's a province by the sea with beautiful islands a few kilometers from the shore. We stayed in Ao Nang area, which is a popular location for tourist. The Ao Nang and Noppharat Thara beaches are beautiful! Endless clear unpolluted beach with rows and rows of various shops and restaurant to keep you at ease. Endless rows of shops, restaurants, spas, and travel agents! Oh, we stayed at the Sunda Resort. It's a 3-star resort in Ao Nang. Unfortunately it's not by the beach. Fortunately they have free tuk-tuk service for the guests to go to Ao Nang and Noppharat Thara area. Even though it's not a luxury 5-star hotel, WE TOTALLY LOVE IT! i love the private-ness, tranquility, and the friendly staff. The rooms are beautifully decorated, spacious, and really clean! Check out the elephants on the bed.. Two cute! Like i said, finding food is easy in Ao Nang area as there are rows of restaurants. There are variety of them; Italian, Indian, Mexican and of course, Thai and Asian food. However, it's quite hard to find Muslim foods in Ao Nang area.We found Muslim foods in Krabi town (which is like 30 minutes taxi drive) and only on the last day we found a Muslim restaurant in Ao Nang (away from the beach- explains why it was undiscovered). Night market in Krabi town. This is not steamboat like the ones we have in KL. The sticks are actually deep fried! So it's like friedboat? At a 'medan selera' nearby a port in Krabi town. My supposedly oxtail doup with rice. OMG this is the most delicious bottled coffee i ever had! Too bad we don't have it in Malaysia. Lunch were provided by the tour agents as we went for an island hopping trip. Again, for dinner we went to Krabi town and found a BBQ-steamboat halal restaurant. With buffet concept, they only charge 190 Baht per pax (around RM19 per pax). The restaurant's name is Rabeab's Kitchen Inter-Buffet. We were beond starving that night so we ate like pigs! Lunch courtesy of the tour agents. Halal BBQ-steamboat meal at Rabeab's Kitchen Inter-Buffet Restaurant. We didn't have time for proper lunch as some of us went to the spa, and another two went bungee jumping (guess which session i took? Pampering session at the spa or being crazy and bungee jump?). Obviously we were effing starving when our visiting trip (i'll tell you later) ended at 6pm. We found a Muslim restaurant in Ao Nang, Sareefah Restaurant. Out of all meals we had in Krabi, this dinner we had at Sareefah's is the best!! Oh, sorry gambar makanan tak sempat amek sebab kelaparan tahap kanak-kanak Bosnia, tak hengat bergambar bagai. As Krabi is a beachy destination, obviously the main attractions are water activities. Island hopping, fishing, snorkeling, scuba diving, and kayaking are the main attractions. However, they don't really have water sport activities like jet-ski or paragliding. What we did in Krabi? i'm gonna elaborate a bit about the activities we had. We took the 4-islands Island Hopping Package. It was included in our Go Holiday Air Asia Package. We had so much fun traveling on the speedboat that we forgot to be sea sick :p The islands that we went to are Phi Phi Don , Phi Phi Lay and Bamboo Island (betul ke ni aku pakai tibai je.. haha). We stopped at Maya Bay, Monkey Beach (for open-sea snorkeling), swam at a beach at Phi Phi Don and sight seeing at Loh Samah Bay, Pileh Bay and Viking Cave. The waters are crystal clear. Totally breath taking! 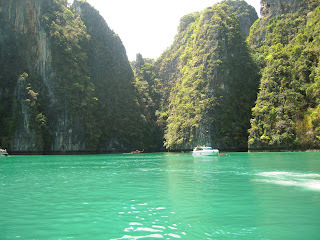 And did you know that the film "The Beach" (starring Leonardo DiCaprio) was shot in Maya Bay? Ok i'll stop babbling and let the pictures do the talking! Pretending as if i'm on my own luxury boat! 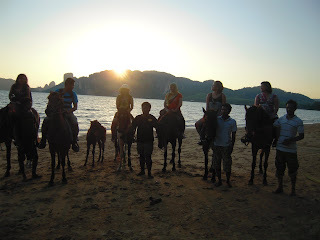 We went to Sathai Horse Stable for a one-hour horse riding session at sunset. 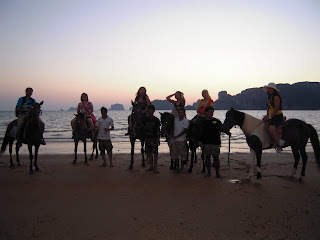 It's a 15 minutes drive from Ao Nang, transportation was provided by the owner of the horse stable. Very accommodating, these people! This is the highlight of my vacation! When i asked Mr. Chenta "Bb, can i bungee jump?" He said "Ummm.. OK sayang. i know you really wanna do this. But make sure you come home in one piece ok? Don't come home in a box"
i love every seconds spent deciding whether to or not to jump. i love the racing heartbeat, wondering will this be my last. i love the feeling of wanting to shout at the instructor, to tell him to "shut up, i'm scared". i love the feeling of standing at the edge of the crane, terrified when i looked down yet excited to jump. And i won't forget what i see when i jump - at the blurring-and-moving trees and mountains, the sound that escaped my mouth. A brave smile. Padahal dalam hati berdebar macam bunyi enjin kapal terbang. Bungee jumping is like suicide+being a yo-yo. You'd thought the terrifying moment is over once u reach the bottom of the jump. Before you know it, you're soaring up to the sky and fall again, and up to the sky and fall again. The process seems endless! i think this yo-yoing part is the scariest! i really shouted "Stopppp! Stop laaaa!" 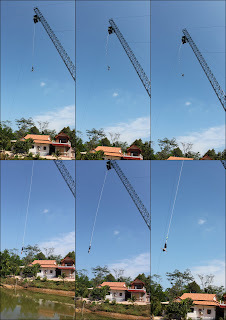 We didn't plan on doing bungee jumping in Krabi as we didn't know they have it. When we arrived at the hotel and saw the pamphlets, we knew we're gonna do it. No turning back. It costs us 1300 Baht (around RM130 which is super cheap! 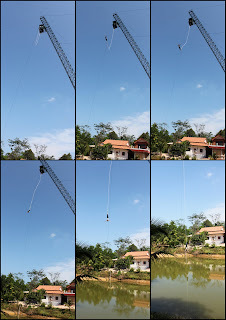 ), and it takes about 10 minutes to tie the rope and things to our legs, 5 minutes of traveling in the crane, 40 seconds to debate whether to jump or not, and 1 minute to jump and yo-yoing. i can now officially tick off one of the items in my "30 Things To Do Before i Turn 30" list. Elephant Trekking, Visiting Tiger Cave Temple, and Swimming at the waterfall and hot spring. These activities are included in a tour organized by Unseen Excursion. It cost us 1100 Baht each and started at 12pm and ended at around 6pm. Elephant trekking is basically riding on an elephant for an hour. To be honest, it's quite boring to sit on an elephant for an hour and walk thru semak samun. If you're "lucky" the elephant will make a stop to poop. Euwwww! After elephant trekking we went to Tiger Cave Temple. It is actually situated atop a mountain and you have to climb up 1237 stairs to see it. No, thank you! So we just saw the temples situated at the ground and in the cave. The beginning of 1237 steps to the top temple. Houses for monks who come here to meditate. To wrap up the trip, we went to a Bang Kram waterfall hot spring for a dip in the hot and cold water! Tempat ni tak la cantik sangat. The uniqueness lies in hot water spring yang berada di atas dan mengalir sebagai air terjun yang sejuk di bawah. There are LOADS of spas in Krabi. Luxury spa, non-luxury spa... For every 4-7 shops, there'll be a spa in Ao Nang area. They come with really CHEAP price tags!! 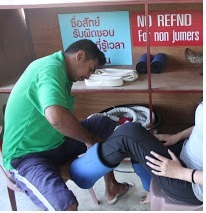 Thai massage ranges from 200-250 Baht per hour, manicure at 200 Baht, pedicure at 250 Baht, hair treatment ranges from 500-1000 Baht, aromatherapy massage at 300 Baht.. These prices is half of what we pay for in KL! So girls (and you metrosexual guys!) don't even leave Krabi wothout going to the spa! Bottom line is, I LOVE KRABI! i might come back and this time, i'll make sure i'll stay longer. 4 days are not enough. 6 comments on "Krabi Getaway!" good for u tif...wish had been there too.really need a beach vacation.hahahahaha!!!!! Hi! I'm going to Krabi! Would like to ask u if I can get my Hotel by walk in? Read frm another blog said it is 40% cheaper then book it on line. Is tht true? umm.. i'm not sure about walk-in rates. but from what i learnt in Krabi,hotel rates differ from time to time. they increase during peak time.i bought the holiday package during travel fair and it only costed me RM500 (3 nights stay,return flight tickets, and islands hopping trip). Err..even though that doesnt answer ur question, i hope it helps! hi princess, thanks for the info. nak tau, u bought the package from MATTA Fair ke?